I love quinoa. Sure, it has a great nutritional profile, but what I like best about it is that it’s fast: it cooks in about a third of the time it takes to cook brown rice, which makes it possible to throw together a meal at the last minute and still enjoy a whole grain. By now you probably know that quinoa is an excellent source of high quality protein. It contains all nine essential amino acids and is especially high in lysine, an amino acid that is scarce in most plant foods but is necessary for tissue growth and repair. What you might not have heard is that quinoa is full of all sorts of other nutrients. According to The New Whole Foods Encyclopedia, it’s a rich source of calcium as well as magnesium, iron, copper and phosphorous. And to top it off, it’s gluten-free, so those who are sensitive to gluten can enjoy it in its whole state or made into flour, pastas, or breads. I’m glad that it’s so nutritious because it means I can get a healthy meal on the table quickly on nights when it’s gotten too late to get a pot of rice cooking. Though the grains are smaller, quinoa can be used in almost anything rice can. It can form the base for a stir-fry or a bean dish, it can be made into pilafs, and it’s especially good in grain salads. 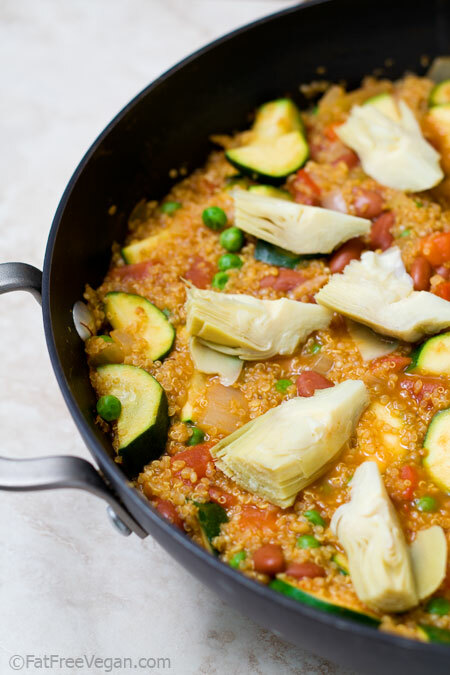 In the recipe below, I used it instead of white rice in a vegetable paella and discovered another way that my family loves quinoa. This is one of those dishes that seem to improve overnight. Reheated leftovers make a great lunch. Spicy food lovers note that this is a subtle dish, not a spicy one. Sauté onion and garlic in a deep non-stick skillet with a little water until soft. (I use my deep, 13-inch saute pan for this.) Add the quinoa and saffron and cook, stirring, for another 2 minutes. Add paprika, cumin, cayenne, tomatoes, peppers, beans, and 2 3/4 cups vegetable broth. Bring to a boil, reduce heat to very low, and cook covered for 15 minutes. After 15 minutes, check to see if more broth is needed. If it looks dry, add the remaining vegetable broth. Place the zucchini on top of the quinoa and re-cover. Cook for about 5 more minutes, until quinoa is done. Remove the cover, stir in the peas, and cook uncovered until peas are warm and all liquid is absorbed, about 5 minutes. Arrange the artichoke hearts on the top and serve. Add salt at the table, if necessary. So many thanks for sharing your wonderful recipes, With the Paprika app, it makes my vegan fat-free lifestyle so much better, and easier! Concerned about using the coated pan in your cooking, My Staub pans are not as harmful to us, but they are not perfect either. Aluminum can come at us from cosmetics to pans, it is a nerotoxin and is one of the key’s to Alzheimers.